“It’s only September,” you say. “Christmas is still forever away.” But for retailers planning for the festive period is imperative for sales. This article will explore the 2017 trends that are transforming eCommerce so you can get your plans solidified early. With under 16 weeks to go, the festive season is just around the corner and so are the high street deals! Retailers need to start planning now. With customers looking for bargains constantly, it’s assumed buying is starting earlier – when the offers start. That makes the months before December prime purchasing times. Though it’d be absurd if the festive period didn’t bring a buzzing atmosphere to every shopping center and department store, there is an increasing number of people swerving the shops and heading online. And some that do both. These are the ‘omnishoppers’. Onmishoppers are the savvy individuals that do both: see in store but buy online and research online but buy in store. They cannot be confined to one method of browsing or buying. In the UK, 90% of shoppers exhibit both behaviours which makes life for retailers a little harder. Instead of being able to focus on marketing products either offline or online, they must do both – that’s if they want to survive, grow and get that Christmas bonus! Okay, so forget the Omni shoppers for now. Although this style of shopping is amongst the growing trends, we must not neglect the mobile shoppers who focus their attention online only. In the UK, 52% of retail eCommerce transactions take place on mobile. Many of these transactions have also started and finished here. With mobile shopping experiences improving, the traditional approach of ‘browsing on a smartphone, buying on desktop’ is fading. Creating a mobile friendly website or even your own retail app can help to enhance a customer’s smartphone shopping experience. That’s great for retail businesses for reaching a bigger audience of hungry shoppers, festive season or not. Remember: if your online retail store isn’t mobile optimised, you can wave goodbye to up a good chunk of customers. With new styles of shoppers, new processes are needed. Retailers should welcome updates to shopping experiences with open arms. Let’s start with the checkout. Simplicity is key. Reducing the checkout fields to the bare essentials and condensing the entire process into one cohesive page makes happy buyers. Optimise buttons to every finger tip – big and small. Make important text a readable size for every user. Don’t limit access! Remember: Overlapping elements can lead to growing customer frustration. When users click on the button “buy” they don’t expect to return to the previous page. But, with the “go back” button being so close on the page, many users can mistakenly click the wrong call to action. Leave enough space between page elements to help remove the stress of checkouts to make it easy-peasy for everyone. If a customer can see that their payment will be completed in 3 simple steps, they are more likely to continue with their transaction. Including this information will show users that you think of them. You value them and know that they value their time. That’s why you have indicated how quick your payment process is so they can be through in no time. For the speedy shopper, it’s great to offer guest checkout. Okay, so it might not help you remarket your products to those customers, and you might not get the important details you need, but if your product gives them a good enough experience, making a return is on the cards. Christmas time can be a rush for most if not all. Some people will run a mile at the thought of filling out a signup form at such a busy time of their lives. Make it easier for them and give them what they want. Worst comes to worst, you made an extra £150. It’s pretty obvious that once a user reached the checkout process, they have expressed a willingness to buy. Your website no longer needs to be a salesperson, the customer is sold and wants to make the sale. Bearing that in mind, distractions must be deleted. Don’t drive your customers elsewhere with other promotions. Amazon’s checkout is a great example of keeping customer attention where you want it: in buying mode. Through removing the standard header, including the menu links and the search bar, users refrain from going elsewhere. As the festive period for retailers generates lots of their annual sales, keeping buyers interested in you and only you is crucial for survival. If it works for Amazon, a business worth billions of pounds, it can work for you. Each customer has a preferred way of paying for a product. Making use of the most common methods of payments can help to make transactions more secure and save time filling out forms. Many trusted services such as Google Wallet, PayPal and Amazon help payments be made in a few taps. Information is automatically populated to satisfy the impatient buyers and they feel a lot better not having to whip out their credit cards and spread their details on another payment platform. Instead, the information can be kept safe with a single payment site. What We Suggest: Utilise the latest trusted payment services out there! PayPal is a must-have. It’s security and convenience screams “positive checkout experience”, so use it! Records have skyrocketed for those days dedicated to retail deals. We’re talking about Black Friday, Cyber Monday and those daily, weekly even monthly sales, that many retailers spring upon buyers in the build up to Christmas. What is ‘Black Friday’? If you aren’t familiar of the term, no problem. Black Friday is only one of, if not the biggest day for shoppers to buy mega discounted products and services. Commencing this year on Friday 24th November, it’s the peak time to buy bargains. With Christmas in touching distance, there’s no better time to get the ‘friends and family’ presents, the ‘just because’ gifts and the ‘go on treat yourself’ deals. Following up from the Black Friday deals comes the great Cyber Monday. Made specifically for eCommerce shoppers, this online shopping bonanza is the perfect way to round off a four-day weekend of mega sales. Keep your buying eyes peeled on Monday 27th November! We all know those late shoppers: the last minuters. We wonder why they have to get their presents in the nick of time but it’s pretty simple. They do it because they can. And why can they? Well, it’s all possible thanks to enhanced shipping. Present procrastinators purchase closer to Christmas, as the expectation of two-day shipping, next-day delivery, and same-day delivery becomes possible. Buyer behavior is changing with the increased abilities retailers are giving us, which are transforming our expectations. Unfortunately for retailers, banking on customer loyalty to help surge Christmas sales is no longer as reliable. Loyalty to both channels and companies is beginning to fade as customers frequently switch between different devices to storefront when making the same purchase. Why is this happening? Well, with many retail experiences merging into one, shopping on mobile or tablet or storefront doesn’t really matter to a buyer. They simply buy the product that is best for them at the time of making the transaction, no matter what company that is with. As not every brand considers this, they aren’t able to remain consistent from device to device and hence their customer loyalty suffers. Those that can coordinate a continuous approach create a great omni-channel experience, tailored to every type of shopper. 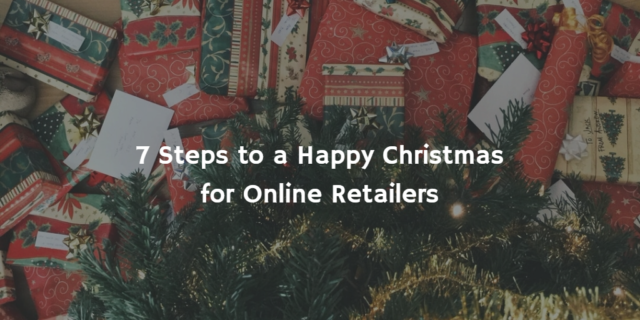 Ultimately, during the Christmas period, shoppers are looking for brands who simplify the process of buying, may it be online or offline. Having all of their buying channels uncomplicated yet still appealing, these retailers can hold onto their customers by making their experiences consistent cross-platform. To help make a buyer happy, retailers should plan ahead to get a mobile-friendly check out in place, deals set up ready for the big sale days of the year and should be creative with their advertising to ‘wow’ their audience. Bringing a festive feel to retail stores helps to encourage buyers to get into the Christmas spirit with you. If done successfully, they end up as returning customers throughout the year, not just for Christmas. Katie Rose is a Digital Marketing Assistant at iWeb, a UK based digital marketing and eCommerce agency. Katie writes digital marketing guides and articles to help retail businesses better their online presence. Her focus is giving retailers useful and informative posts – without compromising on entertainment. She has obtained ALISON Sales and Journalism certificates, and is Level 3 qualified in Digital Marketing. You can read more of Katie’s posts here.